I was trying to think of some things I could use for napkin rings because I'm bored with the ones I have. Since there is so many creative and talented bloggers out there I thought I would ask them to share. If you want to show off your napkin decorating, just leave a comment here when you've posted your pictures. I can't wait to see what you come up with! 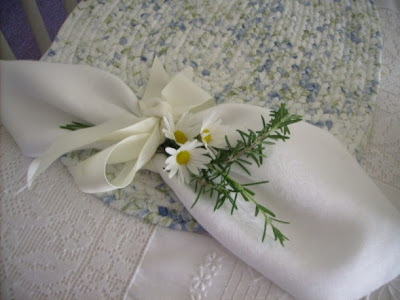 Mine are really simple... a ribbon tied into a bow and then I added some daisies and rosemary sprigs. Even without the flowers, the ribbon alone looks so sophisticated! Fabulous! I will get right on that. I use ribbon, twigs, flowers, grapevine, wire with stars attatched, tiny birdnests attached with wire, Fall leaves, tiny pumpkins, tiny flags for the 4th, you name it, I use it. The ribbon is simple and charming. Quite lovely! I like yours. I use different things. I like the unusual. I often use the grass ties with some type of charm attached, or china clips. I would love to see you in the Fez Medina! You would go wild I think. I sometimes tie on small ornament frames with pictures of my guests. Old rhinestone brooches or chandelier crystals are also fun. They look lovely just as they are!! i like your idea - A LOT! simple and beautiful. i have seen a lot of sea shell rings lately. nature is always pretty isn't it? 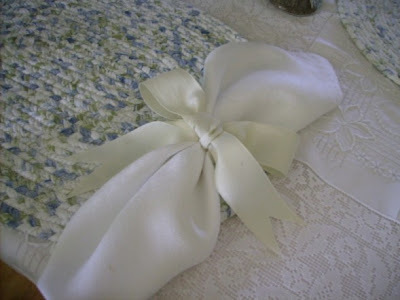 The most elegant table napkins I have seen were tied with a ribbon as yours are, but as an ornament to the ribbon, the hostess used a collection of antique and new (but old looking) broachs....Oh I wish I had a picture to show you! I have posted a coupe of napkin folding pictures to share on my blog. I went to a tea house the other day and they had a really fun summery idea for a napkin ring - they used hair ties. Remember the kind from the 70s with the big plastic balls on the ends? They wrapped one around a rolled napkin and looped the ends over each other. It really was so cute although I know my description can't really describe it well.